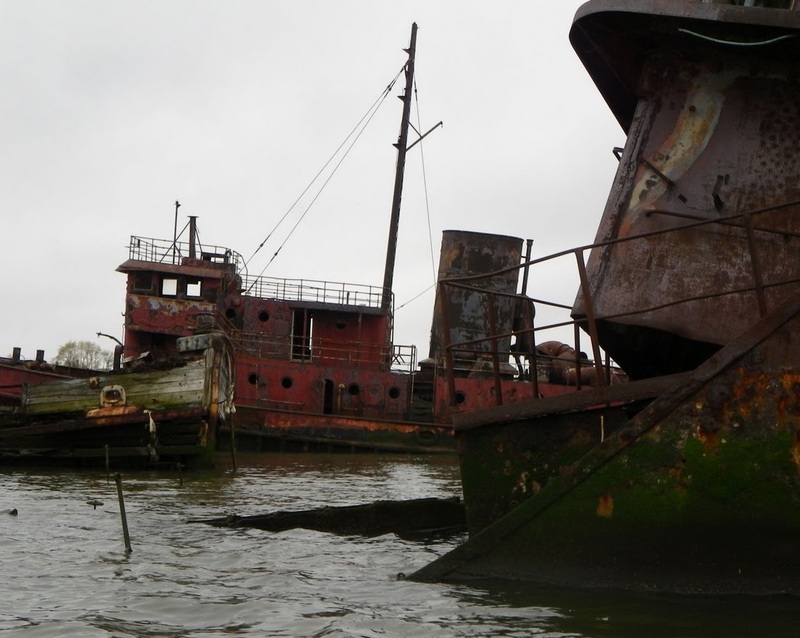 The Graveyard of Ships is tucked away in a bend of the Arthur Kill, the busy commercial waterway at the back of Staten Island facing New Jersey, at Rossville. 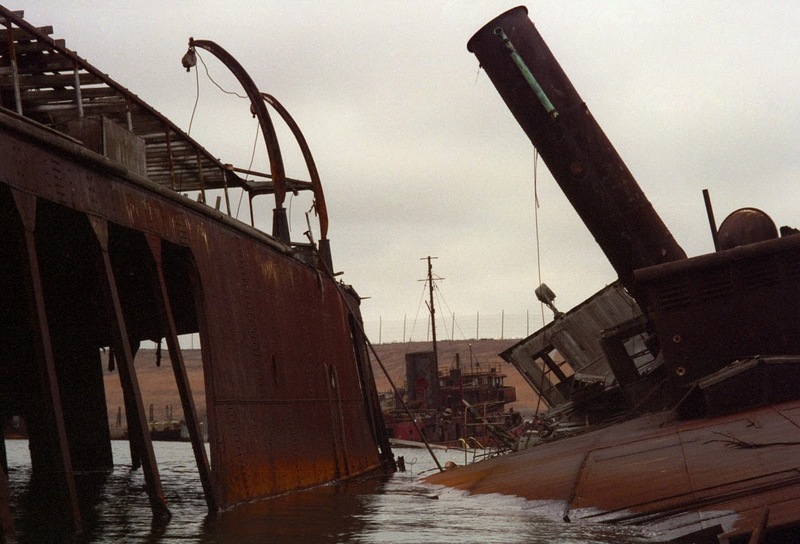 With a colorful history stretching back to the 1930s, at one time the Graveyard contained the remains of over 400 vessels, some more than a century old. Nature is reasserting itself… The hills of the Fresh Kills Landfill are in the distance. 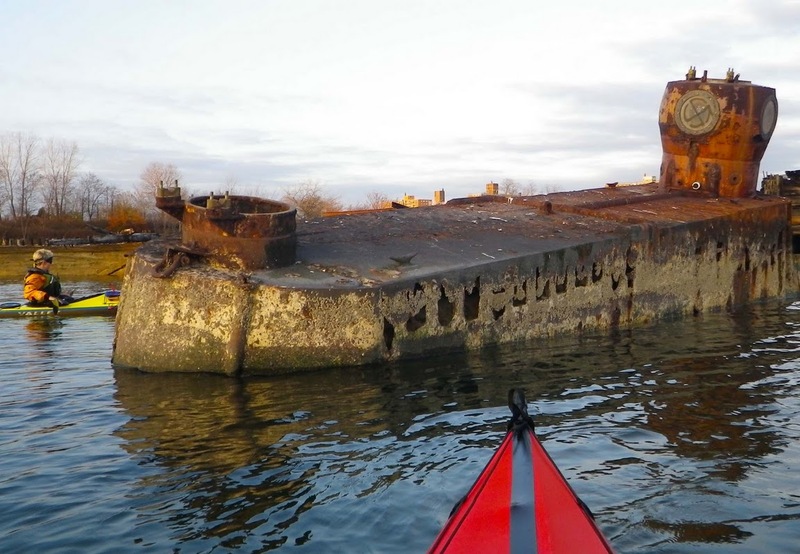 The Graveyard of Ships is a popular kayaking destination (reports and photos by Frogma, Darren Caffery, and Tugster, who identifies many of the wrecks) as well as a magnet for brave land photographers (Opacity, Undercity). 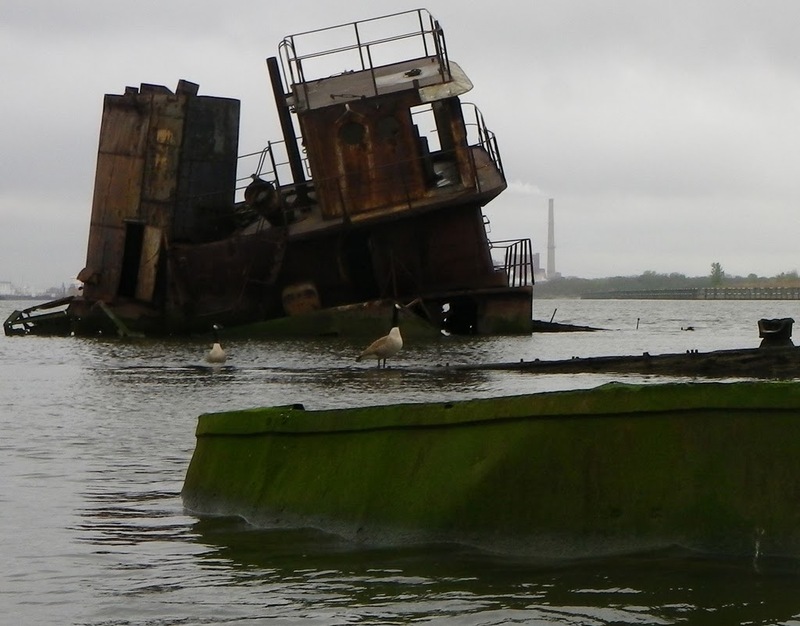 More of Vlad’s photos of the Graveyard of Ships and other wrecks of the Arthur Kill are here, here, and here. 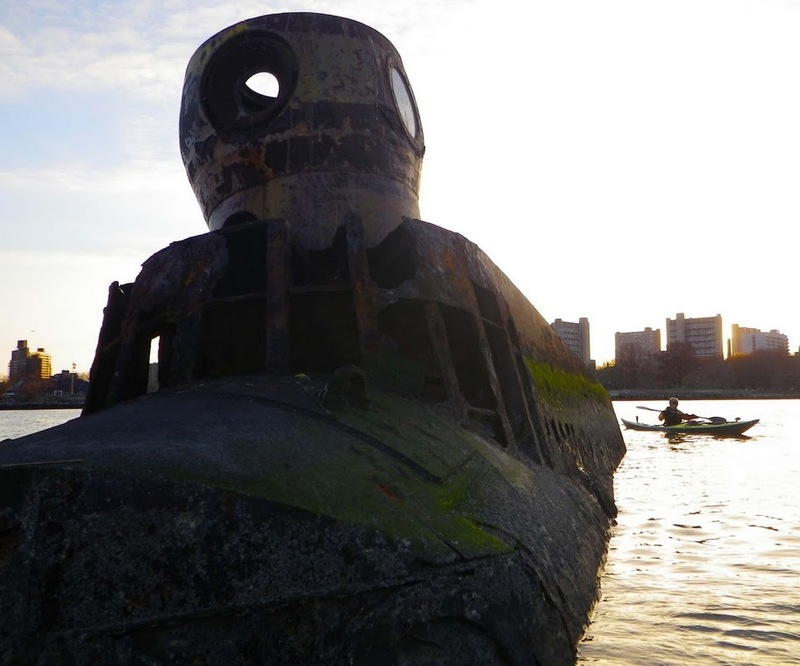 Half-submerged in the shallow waters of Coney Island Creek there lies… a submarine. It’s not exactly like this , but neither is it like this : it is a surprisingly serious submarine. The Andrea Doria was known to be bountifully loaded with such diverse items as a $250,000 solid silver statue of a mermaid; thousands of cases of liquor; tons of provolone cheese; 200,000 pieces of mail that the federal government would pay 26 cents a piece for; the ship’s bronze propellers, worth $30,000 each, paintings locked in air-tight vaults; industrial diamonds; the ship’s $6 million metal scrap value; passengers’ personal property left in several vaults and more. 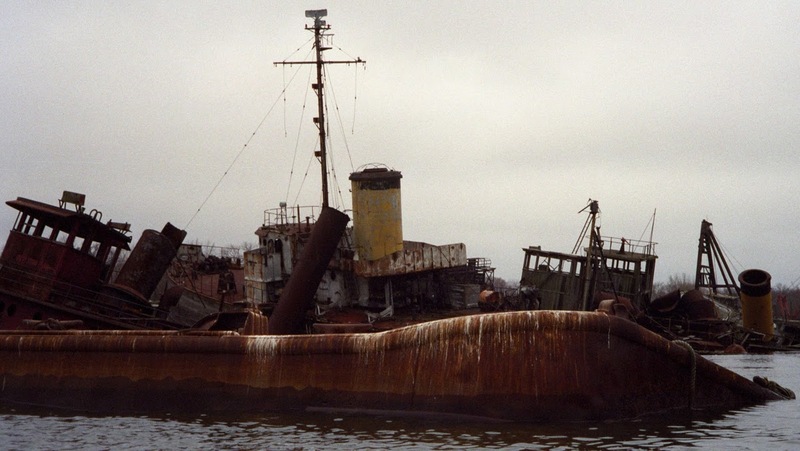 But for want of a nail… Bianco was chronically short of money (the yellow paint of the submarine, some of which remains today, was the cheapest he could find). 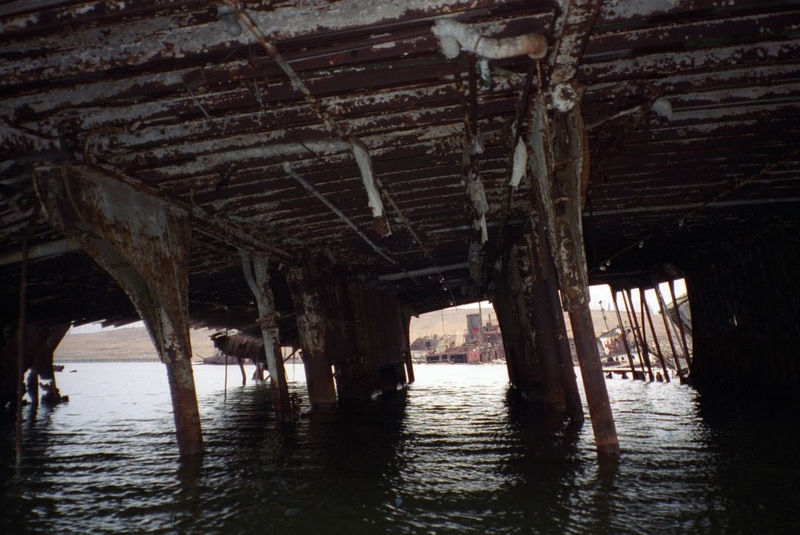 Because the launch was to be paid for by the pound, he did not ballast the submarine fully, and it capsized upon being lowered into Coney Island Creek. More of Vlad’s photos of the Yellow Submarine are here. Update (October 9, 2011): The “Forgotten NY” page has apparently disappeared, but here is a New York Times article instead. At the border between Brooklyn and Queens, Newtown Creek zig-zags for several miles inland from the East River, becoming narrower and more tortuous and spanned by numerous low bridges. So we were very surprised to find, on a recent kayak expedition into the Creek, in one of its terminal branches a large ship… Schamonchi. More of Vlad’s photos of Schamonchi are here. 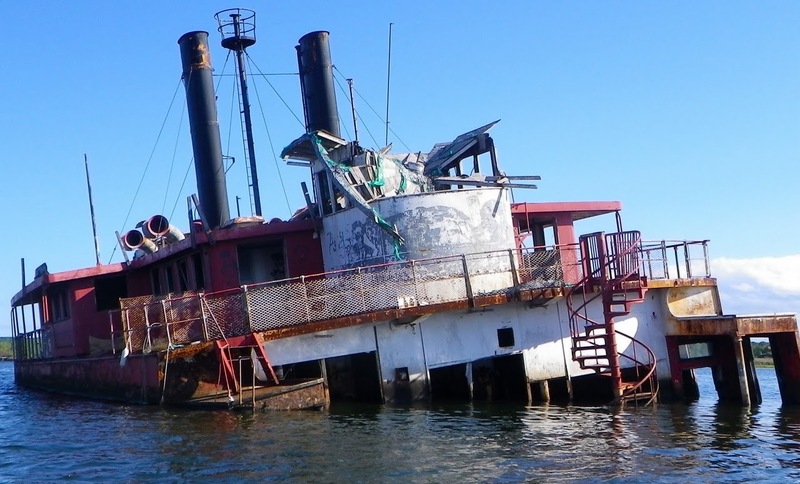 Update October 16, 2013: New developments for Schamonchi… the newspaper headline is “Hipsters forced off floating crash pad”. For details see here and here. 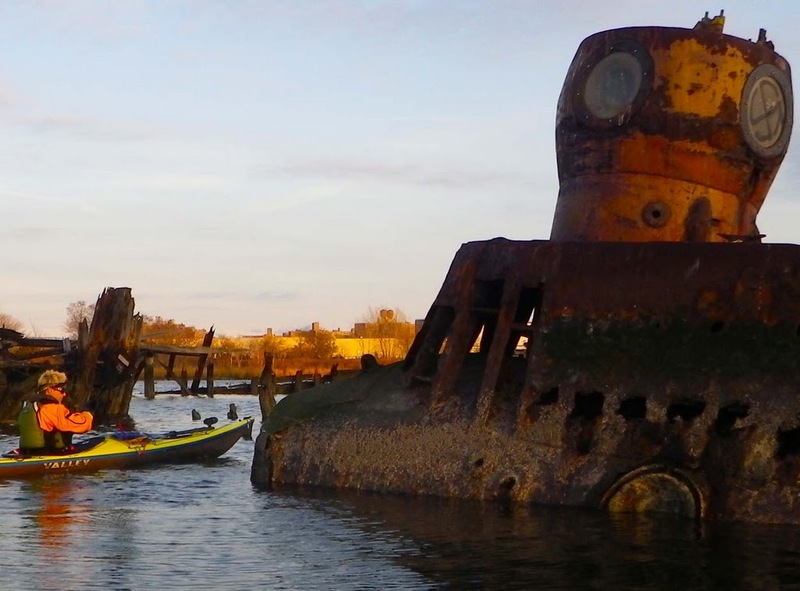 This entry was posted in Kayaking, New York City and tagged Arthur Kill, Graveyard of Ships, Kayaking, New York Harbor, Newtown Creek, Schamonchi, Wrecks, Yellow Submarine. Bookmark the permalink. Ahh, the Schamonchi, I enjoyed many trips from New Bedford to Vineyard Haven Harbor on her, and even thru the Cape Cod Canal to watch whales in the spring. 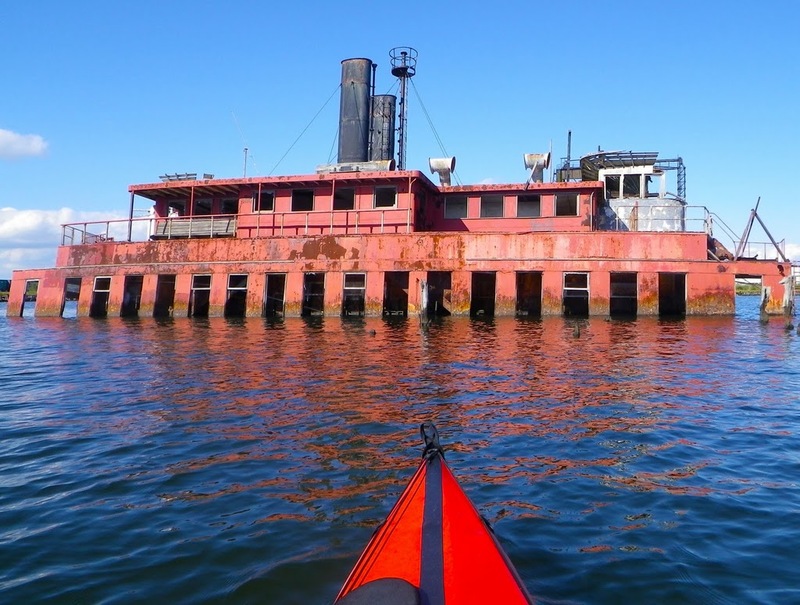 The old push-me/pull-you double ended MV Islander is moored on the SE corner of Governor’s Island. 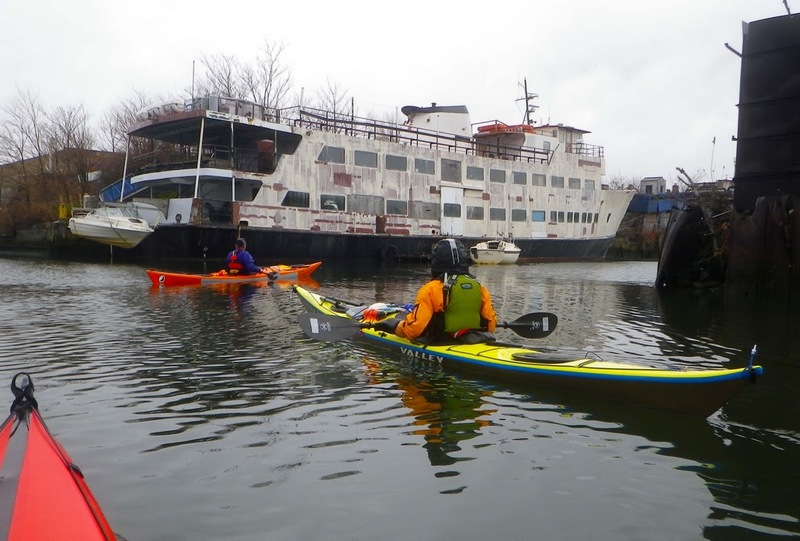 Is NYC where old Vineyard Ferries go to retire? The various fates, mostly sad, of a number of the old Vineyard ferries are well described in a 2010 article, Final chapter: The Islander and other bygone ferries, in Martha’s Vineyard Magazine. These are beautiful! And my old stomping grounds, of a sort. 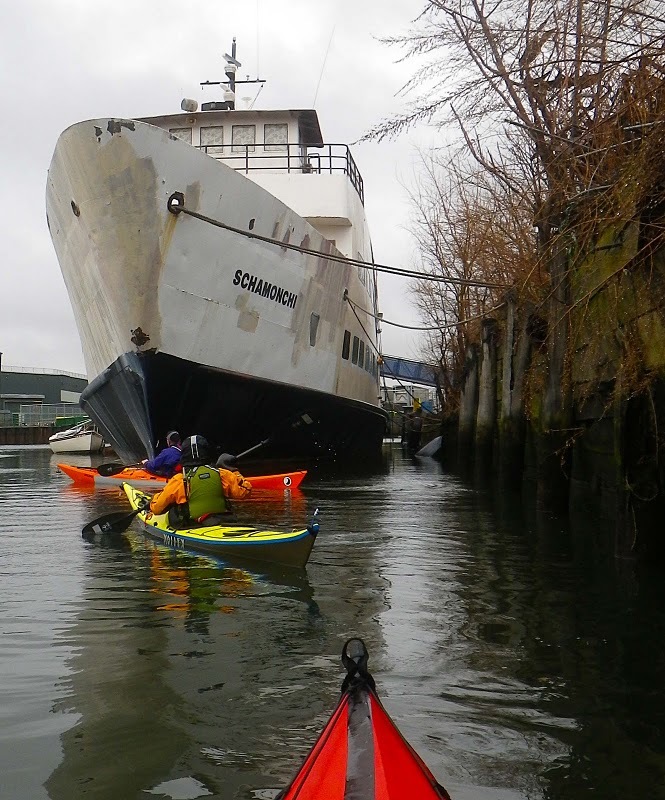 I grew up in NJ and misspent much of my youth in Staten Island, though I didn’t spend time kayaking through ship graveyards, more’s the pity there. 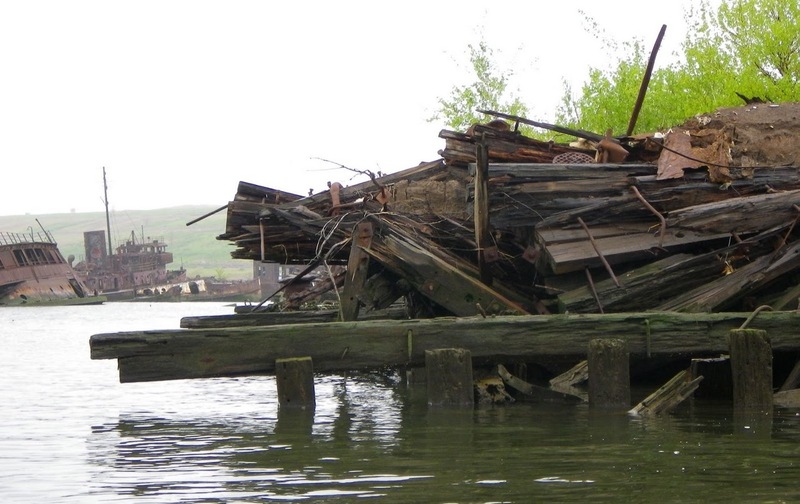 In a story that’s become famous in family lore, my brothers (when they were like 11 and 12 or so) decided it would be a great idea to captain an old rowboat they found on the beach in Sewaren across the Arthur Kill to Staten Island. They were picked up by a tugboat and taken to an office from where my parents (none too pleased) were called to come get them. I may be making the story more dramatic but I do think they were starting to take on water. Ha! I’m sending this link to them both, I’m sure they’ll love it. Great story and I am sure they look back on that time fondly!